So, I stayed up late (cough, cough 1:30 am) last night figuring out how to sew a bubble skirt. 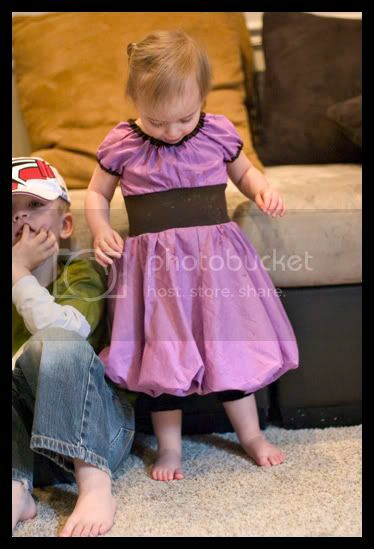 I took the top of another dress, then sewed the band and the bubble skirt to it. I used only stuff I had on hand. That never happens. The fabric is all from my grandma Jensen. The black you see at the bottom is a pair of leggings left over from another outfit. I love the way it came out (sorry about the dirtiness, she won't take it off, which of course, delights me). 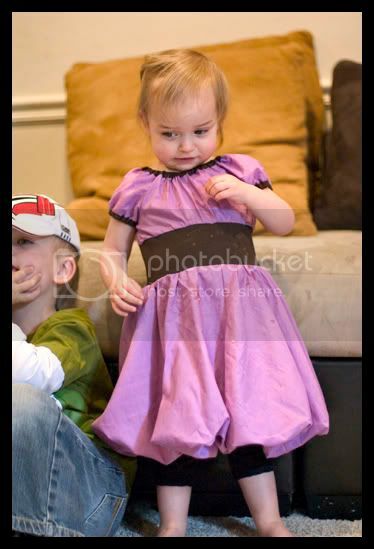 I was thinking of having this be her Easter dress, so I'd like to dress it up a little. What do you think I should do? I thought about crocheting some small flowers to go around the collar. Or I could do a small bow there. Or I could do a fabric flower at the waist. Any suggestions? Leave me a comment! Super cute- you just want to fluff that dress up to it's full bubbliest potential!